The WorkRite Universal Platforms with rounded corners are designed so that the mouse area can be on the left or right side. Fits a 17" (43cm) or wider diagonal desk corner or fits on a straight away when used with the WorkRite® Pinnacle™ Arms. Made of 1/4" (6.4mm) thick, Ultra-Thin™ composite plastic. Includes a mousing patch, mouse trap, document holder and a keyboard/mouse cord manager. 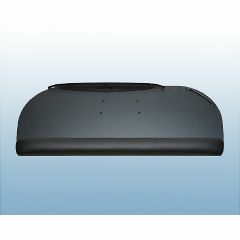 Has one 28" (71cm) long removable keyboard and mouse palm support.